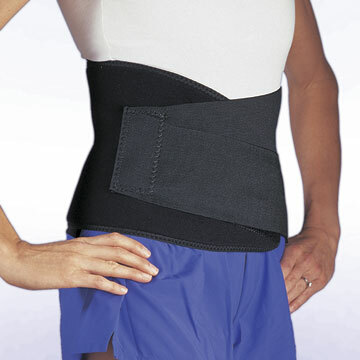 An innovative breakthrough in the design of neoprene low back supports. Exclusive PRO design concentrates the therapeutic body heat where it is needed…while providing firm abdominal support without the heat. The exclusive bell-shaped back panel of thick ¼” neoprene provides maximum localization of heat over the lumbar back and sacroiliac joints. Two additional elastic pressure straps apply additional support and pressure when bending or stretching. 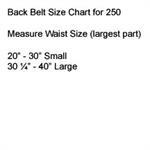 Exclusive frontal elastic “V” belt with breathable padded tongue provides abdominal support. A hook fastener tab provides full adjustment and wearer comfort. Completely machine washable. Available in black only.